It is impossible to analyse the impact of Indigenous sentencing courts on victims and offenders without an understanding of how the courts operate in different locations, and how the Indigenous population is positioned within the broader community (within which the Indigenous sentencing court is located) in terms of employment opportunities, police relations and general living conditions. 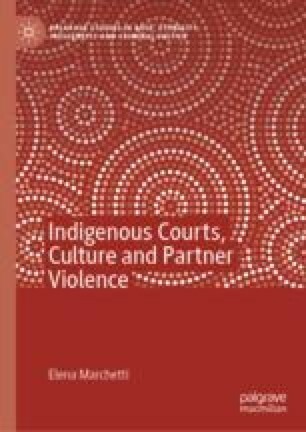 This chapter situates victims’ and offenders’ experiences of the court in a broader community context, and it reveals the different ways in which court processes are modified to be more inclusive of Indigenous experiences of offending and victimisation. It also provides a detailed account of how the Australian Indigenous sentencing courts have evolved throughout Australia and what various evaluations and impact studies of the courts have found. Australian Bureau of Statistics (2004) 6261.0.55.001—Characteristics of Wage and Salary Earners in Regions of Australia, 2000–01. Canberra: Australian Bureau of Statistics. Available at: http://www.abs.gov.au/ausstats/abs@.nsf/Latestproducts/6261.0.55.001MainFeatures32000-01?opendocument&tabname=Summary&prodno=6261.0.55.001&issue=2000-01&num=&view= (Accessed: 22 May 2015). Australian Bureau of Statistics (2011) 2011 Census Community Profiles. Canberra: Australian Bureau of Statistics. Available at: http://www.abs.gov.au/websitedbs/censushome.nsf/home/communityprofiles?opendocument&navpos=230 (Accessed: 22 May 2015). Australian Bureau of Statistics (2013) 3238.0.55.001—Estimates of Aboriginal and Torres Strait Islander Australians, June 2011. Canberra: Australian Bureau of Statistics. Available at: http://www.abs.gov.au/ausstats/abs@.nsf/latestProducts/3238.0.55.001MediaRelease1June2011 (Accessed: 10 November 2013). Australian Bureau of Statistics (2015) 5220.0—Australian National Accounts: State Accounts, 2014–15. Canberra: Australian Bureau of Statistics. Available at: http://www.abs.gov.au/ausstats/abs@.nsf/Latestproducts/5220.0MainFeatures22014-15?opendocument&tabname=Summary&prodno=5220.0&issue=2014-15&num=&view= (Accessed: 16 June 2016). Banks, A. (2015) ‘Aboriginal Court Gets the Chop’, The West Australian, 14 August. Available at: https://thewest.com.au/news/australia/aboriginal-court-gets-the-chop-ng-ya-127355 (Accessed: 20 November 2018). Biddle, N. and Montaigne, M. (2012) ‘Australian Census: Not Quite the US, but Income Gap Widens’, The Conversation. Available at: http://theconversation.com/australian-census-not-quite-the-us-but-income-gap-widens-7676 (Accessed: 25 May 2015). Courts Administration Authority of South Australia (2012) Courts Administration Authority: Home. Adelaide. Available at: http://www.courts.sa.gov.au/Community/Pages/Aboriginal-Programs.aspx-sentencing (Accessed: 11 September 2012). Fitzgerald, J. (2008) Does Circle Sentencing Reduce Aboriginal Offending? Contemporary Issues in Crime and Justice No. 115. Sydney: NSW Bureau of Crime Statistics and Research. Available at: http://www.bocsar.nsw.gov.au/Documents/CJB/cjb115.pdf (Accessed: 18 May 2015). Moore, T. (2012) ‘Diversionary Courts Fall Victim to Funding Cuts’, Brisbane Times, 13 September. Available at: http://www.brisbanetimes.com.au/queensland/diversionary-courts-fall-victim-to-funding-cuts-20120912-25sj5.html (Accessed: 20 November 2018). Queensland Government (2016) Murri Court Opens in Rockhampton. Brisbane: Queensland Government. Available at: http://statements.qld.gov.au/Statement/2016/4/13/murri-court-opens-in-rockhampton (Accessed: 13 April 2016). realestate.com.au (2015) Suburb Profiles. Richmond: realestate.com.au. Available at: http://www.realestate.com.au/neighbourhoods (Accessed: 22 May 2015).